This holds true with Skalonja's latest, The Plague 2: Biohazard Blood. The film takes place immediately following the first Plague film. Tom and Jack are killed, and so it's up to Becky and Jill to continue their journey, trying to find a safe haven in an apocalyptic world. Skewing more towards The Walking Dead than Dawn of the Dead, The Plague 2 is more of a drama centered around survivors than a zombie gore-fest. Although everyone has machetes, guns, and baseball bats, the film goes a lot more towards the existential side than the blood-and-guts. Sure, there's plenty of violence and zombie attacks, too, but the star of the movie is the story and the people. During one particular scene, Becky and Jill are discussing why they even bother going on - what's the point now that everyone they love is dead? Is there really a reason to continue trying to survive? I think it's an incredible scene, and really would be accurate for the situation. If your husband or wife were dead, maybe your children - all eaten by zombies, would you want to continue struggling, nearly positive that it was never going to be "over," and you'd be fighting for survival for the rest of your days? As a storyteller and writer, Skalonja is nearly unmatched in the indie world. The film is tonally dark and depressing, the dialog is spot-on and more riveting than you'd normally find in the independent horror market. You'll often find one-dimensional characters or even characters with no depth at all as you skim thorough a lot of the unoriginal garbage spewed forth from the underground, and you will watch film after film, struggling to find a reason to not hit the stop button on your DVD player. Skalonja's characters are not perfect, but they're so well developed and written so well, it's much more of a loss when one is finally offed. It helps that he uses a lot of the same actors in his films, so by this point I think he knows who will fit well, where they'll fit, and their strengths on camera. I think this comes across perfectly in all of his films, as the acting is a notch above most. 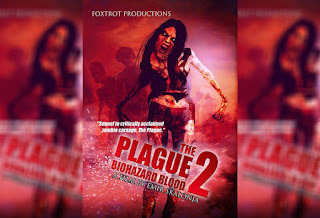 Beautifully shot in every way, from the locations in the woods to an incredible, decrepit abandoned church, The Plague 2 is that rare indie horror film that feels much more like a major production - filled with perfect action spots, spot-on practical FX, and terrific pacing. The Plague 2: Biohazard Blood is a perfect character piece that just also happens to be a bloodthirsty zombie flick.